is Fouéré’s adaptation and performance of the voice of the river Liffey ('Life', Anna Livia Plurabelle) in James Joyce’s famous 'book of the night', Finnegans Wake. Work on the adaptation has been ongoing since 2011 with initial support from Michael Mushalla of Double M Arts and Events, NY; Leanne Donnolley of APA and creative producer Colm O'Callaghan. Performed readings of the work-in-progress took place in Dublin (June 2011 with Rough Magic), in Paris (at the Centre Culturel Irlandais, February 2013), in Lyon and NUI Galway (Art and Geography conferences in February and May 2013). In November 2012, riverrun received an Arts Council Project Award enabling production of the work in collaboration with producing partners. Other artists who have contributed to the development of the work include composers Mikel Rouse and Roger Doyle, designers Monica Frawley and Paul Keogan, directors Tom Creed, Annie Ryan, Sarah-Jane Scaife and choreographer Megan Kennedy. The world premiere performance of riverrun took place at the Galway Arts Festival 2013 on 22nd July. 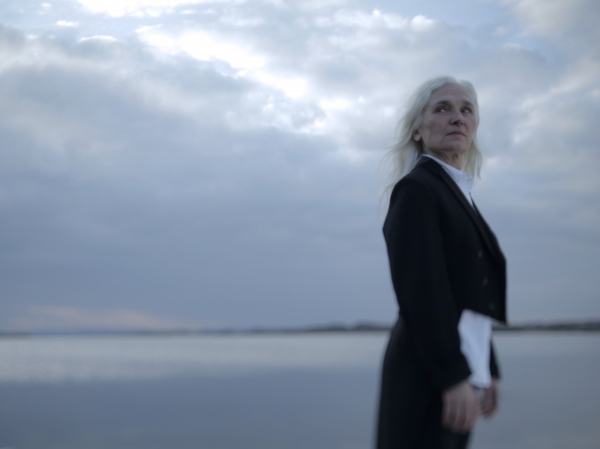 “...masterpieces like Olwen Fouere’s electrifying solo show riverrun, a magnificent 70-minute avalanche of voice, movement and sound based on the final sequence of James Joyce’s Finnegan’s Wake"
“Standing for the city is what Olwen Fouéré does, almost literally, in riverrun, her astounding swim in the swirling, eddying, endlessly babbling waters of Finnegans Wake. Here there is no questioning of what theatre can do, just a fearless plunge into pure performance. Fouéré has stout supports in Monica Frawley’s costumes, Stephen Dodd’s lighting and Alma Kelliher’s richly layered sound design, but this is still an act of lonely daring. And it is thrillingly accomplished. There is rising and falling: the city waking up, the river rising, the world dying and being reborn. There is the dynamic of male and female – the land and the water – between which Fouéré moves with uncanny clarity. And there is the sensation of flowing: the unstoppable surge of the Liffey, of life, of history, of sensations. Out of these elements she creates a unity that is also full of dazzling variation, a mesmerising coherence of body and word, a flood of sound and gesture. We do not comprehend everything but we do apprehend – and are apprehended: seized, arrested, captured. We go with the flow and only later, in recollection, wonder at the marvels of courage and technique.